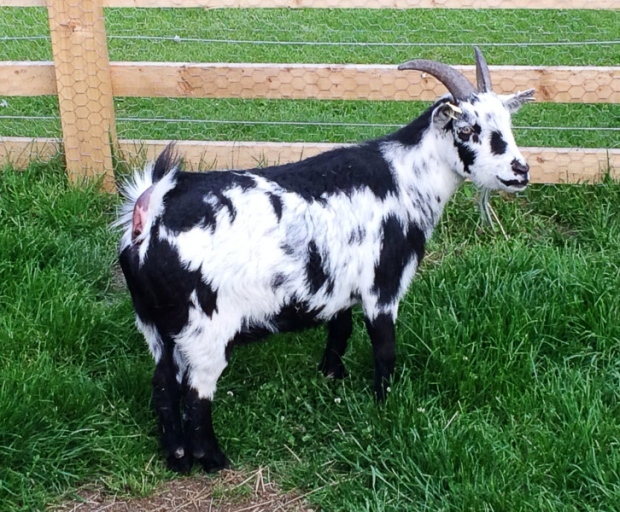 FOR THE last few weeks our visiting Billy goat has been chasing Nessa, our second hopefully pregnant goat, around their enclosure. Nessa had been braying the Billy relentlessly when he first arrived but things had settled down. Now, things had started up again but with him chasing her and after watching this going on we felt that it was time to end his excursion and take him home. All went well and he was returned home safely. The next morning, I was just watching Nessa welcome in the new day when I noticed something very interesting. “Since when has she been weeing like that?” I thought to myself. I stood up, walked around behind her to get a better view and to say I was flabbergasted is an understatement. That was when the penny dropped. ‘She’, was actually a ‘he’. It had only taken a year for me to realise it, but we hadn’t bought two female goats at auction as one was in fact a castrated male. It’s no wonder the two didn’t get on, they were both males and no matter how long we had kept Billy at Long Meadow Farm, he was never going to get this goat pregnant. The decision has been taken to rename him and so Nessa and Stacey are now ‘Gavin and Stacey’. We have been asked many times since our sheep arrived last year if we do our own shearing. We don’t and early on Monday morning Mark our shearer arrived to take care of our little flock. I was very quickly reminded why I don’t shear them. It was enough just rounding them up and handing them to him. It is such a skill and for a young man he really knows what he’s doing and does a great job. We were on a roll this week with the sheep and whilst I had reinforcements over, my Dad, whom I had roped in again, assisted me in gathering them up, including the lambs and taking care of various necessities to make their lives more comfortable. They needed to be treated for flies, they needed worming (it’s so much easier now that I know how a drench gun works) and the lambs needed vaccinating. Things were going surprisingly well and I felt like I was getting the hang of things in another part of smallholding life. That was, until I made a tragic error. One of the wooden field gates I used, had in fact been put in upside down and so the larger gaps were down at ground level which enabled the smaller lambs enough space to make a break for freedom. As you can imagine, it took a while to round them up but we got it sorted eventually. Finally, I just wanted to mention what gave me the biggest laugh this week. I was filling up the cows drinking water when I watched Monica, our oldest Highland cow as she was walking away from me. I was focussing on her back legs and that was when I noticed how she walked. She was walking like a right old tart, with a skirt which was far too tight and very high heels. I could just picture her walking down Micklegate, on a Saturday night, now that would be a sight to see!